Good news just in today from Steve Reoch at All Ocean Yachts as he represented the buyer in the recent sale of the 40.5m motor yacht Queen of Diamonds, with Stuart Larsen at Fraser Yachts acting for the seller. Queen of Diamonds was built by Feadship's Van Lent yard in 1970 and has been refitted several times, most recently in 2008. Her Robin Rose interior sleeps eight in a master and three twin staterooms and this superyacht has sailed around the world three times. 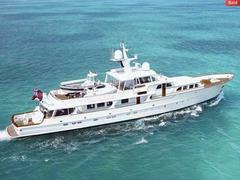 Now preparing for yet another circumnavigation, she was asking $6.25 million.